The last one is by far the most exciting! We are just thrilled and growing into a further understanding of how great God is. Without going too far into detail, my husband and I chose to leave our family planning completely up to the Lord without any interference from us. With that decision made, however, we always expressed in prayer and to each other that we would love to wait 3 years to start a family. It sounds strange, but my husband and I had complete peace in the fact that our desires had been lined up with His will. We planned a two month trip to Europe to celebrate three years of marriage and, in typical God fashion, on the morning of our 3 year anniversary, I found out that I was indeed pregnant. God is so faithful! Now, at fifteen weeks pregnant and past the haze of trimester one, I have some takeaways that I hope help you whether you’re hoping to become pregnant, can’t see the end of Week 10, or just need a little bit of entertainment. 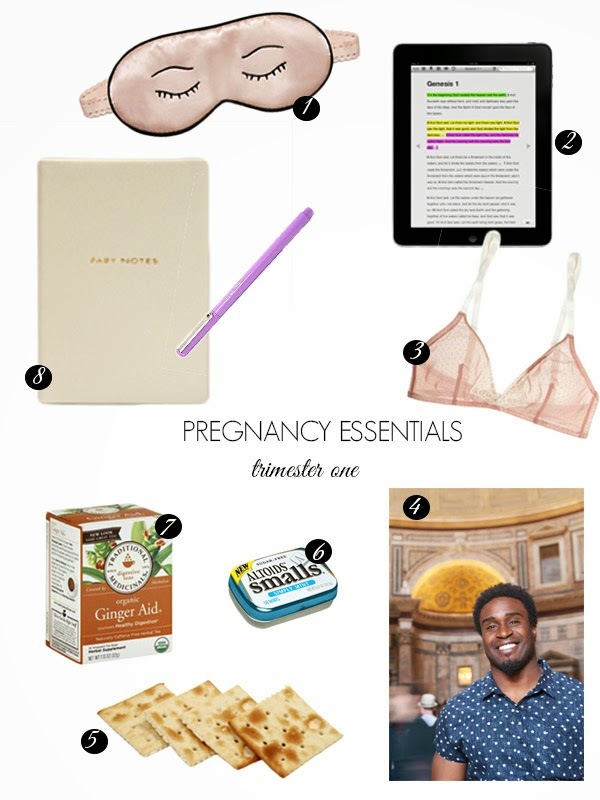 Without further ado…drum-roll please…my First Trimester Essentials. 1. Sleep Mask: One thing to not underestimate in the first few weeks of pregnancy is our ability to lose interest in anything that doesn’t involve closed eyes, fetal position and drool. The first trimester sleep struggle is real, y’all. I have always struggled with napping and sleeping in general, but anything from walking to a restaurant, eating a meal or just existing would send me looking for the nearest bed. My eye mask was a life saver in those extra bright hotel rooms. 2. Bible App: Guys, the thing about pregnancy is that it is such a sacred and incredible time hidden inside a pretty big challenge there at the beginning. Nausea, exhaustion, serious hormone surges, emotional question marks…it takes a whole lot of strength to stay positive in those times. In moments when I found myself weak or fearful over all the scary things these books say, I was so grateful to be able to turn to the Word and fill myself with truth. This truth is most comforting at all times: I can do all things through HIM who gives me strength. 4. This man: As dramatic as it sounds, I truly don’t know how I would have survived the first trimester without my guy. Since we found out about this beautiful baby smack dab in the middle of a two month Eurovacation, I didn’t have the comforts of home, my own cooking, my girlfriends or family or even my midwives to settle me. Every outburst into unexplainable, over dramatized tears, every “is this cramping normal” “I think I ate a cheese on the no-no list” “what if my child is as awful a teenager as I was” was patiently and sweetly met by this man. When I truly couldn’t leave the bed for the majority of the day, this man ventured through whatever foreign city we were in to find a protein my stomach would approve of. When he had to enjoy our prepaid excursions alone he gladly lugged around my DSLR camera so I was able to see exactly what he saw and experience it as well. He ate his meals on the floor, in the bathroom and even nearly under the bed when my super-sonic smell couldn’t quite handle his curry/greek salad/barbecue. God has so richly blessed us in the gift of great husbands and my heart is bubbling over with love for this one. 5. Saltines: And for the MVP of my entire first trimester: Saltines. With the salt scraped off. Every day. For three weeks. I’ve accepted the fact that my child might come out a saltine… It’s a little bit inevitable. 6. Mints: Just trust me. 7. Ginger Tea: I have been a huge Ginger Tea fan for years, but never have I sung their praises more than in the first trimester. Ginger has kung-fu powers against an upset stomach and when it seemed like nothing would work, having a pouch of tea with me at all times truly made all the difference. Of course every pregnancy and every woman is different, but these are the items that made the praise journal over those long weeks. I ask for your grace and understanding as I adjust to this new phase of life. As soon as I found out about this little life inside me, I became more protective and shifted in a way I didn’t expect. The over-sharer part of me seems to have disappeared for now. I’m not sure what sharing will look like for me in this process. I am so thankful for the millions of mothers out there who shared everything throughout their pregnancies- they gave me hope and insight that I desperately needed some days. I hope to inspire and to go exactly where the Lord leads me. Thank you for stepping into this journey with me!